So is this the latest one of them for free fonts ? well good find ;) thanks for sharing. This is a really cool website, the design is very nice and lots of useful fonts. 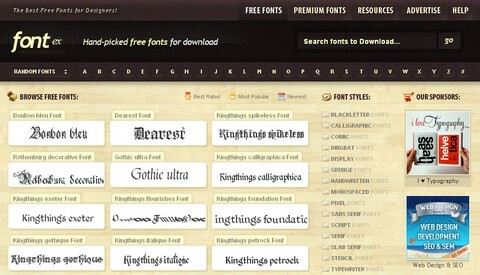 Awesome website for font downloads. Thanks for this excellent resource! does anyone have trouble accessing this site? can only think of 1 thing though i’m not sure, but this site is made available only in certain IP ranges? only for USA or something like that? i’m from belgium and the site just starts loading for 30 sec then gives a network error. @Sander: I’ve got no access problems from Germany. guess i figured it out. this is actually the first site i can’t visit @ work. anyway very easy to use website. well, lots of pirated fonts there, I’m just saying. Some of those are commercial ones (NOT FREE) so if you run into troubles….you were warned.